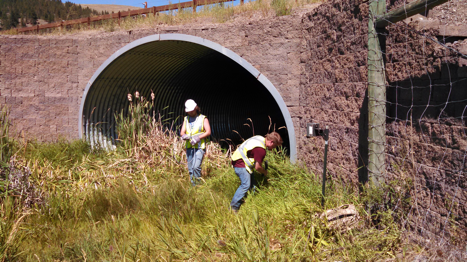 Field techs installing a camera in the habitat surrounding crossing structures to compare to those installed at the structure entrances. Imagine that you could close your eyes, point to a map and wherever your finger lands, you would be in that spot when you open your eyes. If you did this anywhere in the United States, at any point you picked, you would be within 22 miles of a road. And, there is an 80% chance you would be within just one mile of the nearest road. Road are everywhere. In fact, if you were to consolidate all of the roads and parking lots in the US into one place, you’d have enough asphalt to pave the entire state of North Carolina. All of these roads are a major burden for wildlife and ecosystems. Roads impact wildlife through direct mortality from vehicle collisions and also indirect effects associated with habitat loss and fragmentation, behavioral avoidance, pollution, etc. that always accompany roads. Because of all of these factors, transportation infrastructure is one of the largest impacts humans have on ecosystems. However, there are projects springing up that aim to mitigate some of these negative effects. 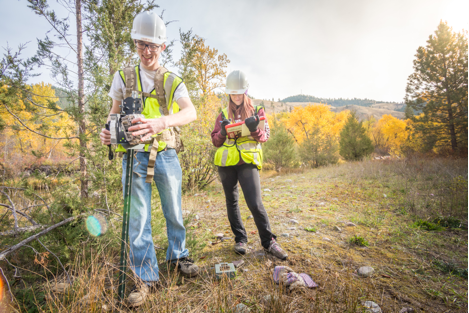 One of the largest such project is taking place on the Flathead Indian Reservation in western Montana (http://www.peopleswaywildlifecrossings.org/) where almost 40 wildlife crossing structures have been installed in a 50-mile stretch of highway, with even more planned in the near future. The idea is that by installing crossing structures, wildlife will feel safer and more comfortable crossing the highway which will decrease mortality and increase habitat and population connectivity. These crossing structures come in many shapes and sizes. Some look like vegetated bridges over the highway while some look like large tunnels passing underneath the road. Despite these crossing structures popping up all over the world in road planning projects, we are still not really sure how well the different designs work, if at all. The reason for this uncertainty is simple: there is no way to experimentally test these designs without installing them into a road. And at a price tag between a few hundred thousand and a few million dollars each, we don’t have the option of building testable models. Fortunately, as more structure are installed each year, we gain new data points for comparison. During my master’s degree at the University of Montana Environmental Studies department, I worked with the Western Transportation Institute to analyze how large mammals interact with crossing structures. In our recently published study (https://www.frontiersin.org/articles/10.3389/fevo.2017.00122/abstract), we compared 15 structure of almost identical design to see how well they worked and estimate the amount of variability in wildlife use. 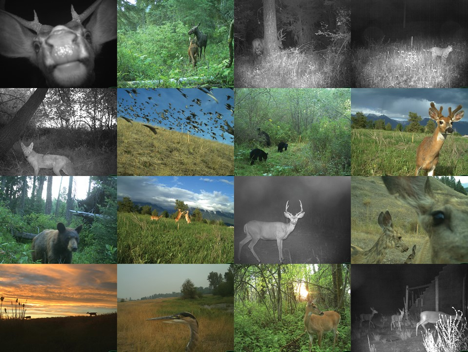 A few of the almost 200,000 images captured by motion-activated trail cameras during the project, representing 24 different species. For an entire field season, we hike motion-activated trail cameras out into the habitats surrounding the structures and placed two cameras at the crossing entrances. By comparing the natural movements of animals in the surrounding to their movements through the structures, we were able to estimate how well the crossing designs performed. 1.) These structure do, in fact, promote wildlife crossings in general. 2.) But, the location really matters. 3.) And, we need WAY more structures if we hope to completely restore connectivity of movement. So, the next time you find yourself cruising down the highway, consider how the road corridor looks from an animal’s point of view. While we can’t eliminate roads, we can do our best to reduce their impacts, but it will take pressure on highway planners (via our state and federal representatives) before the tides change. Field techs installing a camera trap at the entrance to one of the 15 arch-style structures included in the study. A. Andis is a PhD student at the Yale School of Forestry and Environmental Studies. This entry was posted in People, Wildlife and tagged A. Andis. Bookmark the permalink. ← UHPSI Alum Catherine Kuhn Publishes!